Spring arrived this week. The ornamental trees and shrubs are blooming. The regular trees are finally giving us a hint of green. The sky was brilliant even though the air was still too cool for any outside activity short of a brisk walk. The weather definitely gave me spring fever. I got that "go out and play" anxiety but really wasn't motivated to do much. E bay. Except for a couple small sales on Monday, the week was a dud. This added to my restlessness since it took away my busy-work. I hope springtime + Easter vacation was what conspired to pull people away from their computer. Ebay keeps tweaking how items in stores are found (compared to auctions) and my fellow store owners are all anxious that a bad week of sales means we got tweaked into invisibility. I poked away at getting more things listed. 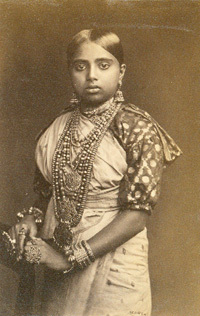 Put up a few auctions (like this Scowen photo of a Ceylonese woman from the 1870s). Other business. A former colleague from the Institution recruited me to facilitate an all-day retreat for the Executive Committee of a local consortium of youth-serving organizations. (See how fast I slip back into agency-speak?) That's on the 28th. It should be fun to talk the talk again with this small group. Creative. I've been poking away at writing a script for a radio production -- an old topic from my Mad in Pursuit journal. But I'm finding it needs more reworking than I thought. It's coming along, but I can seem to write or revise more than a couple sentences a day. Must be that spring fever. Date with my husband. Jim and I went out for dinner last night, then to a program at the George Eastman House: "The Tampered Image." Like music remixes and mash-ups, there's a school of video art (I guess you'd say) where the artist takes found film footage and manipulates it into something else. A few of the concepts escaped me. A few of the looping tracks creating pounding noises that went on way too long. But overall it was interesting and stimulated to see what creative people can do (and what they can spend years of their lives obsessing over). There was a film ("Daylight Moon" by Lewis Klahr) that wasn't old film footage. It was a collage-y film of found objects that combined with a wild soundtrack to create some overwhelming sensations -- hard to describe. But it made me think it might be interesting to also turn my radio production (above) into a little movie using the same techniques. I need to finish my writing first! Thumbs Up if you liked this entry.